Danielle Hill achieved the nomination time for the Commonwealth Games on the final day of the Ulster Long Course Championships in Bangor. The Larne teenager lowered her Irish record by winning the 50m backstroke in 28.72 seconds, under the Commonwealth consideration mark of 28.81. 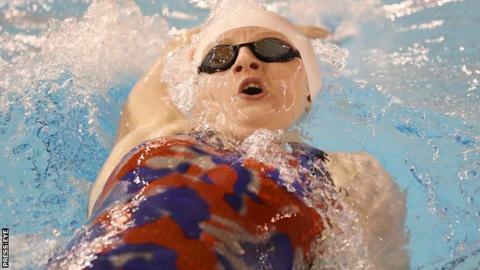 Hill becomes the fifth Northern Ireland swimmer to make the selection target. She will now wait on the announcement of the team to travel to Australia at the start of January. Hill represented Northern Ireland in Glasgow in 2014. Jordan Sloan, 24, who gained the nomination time on Friday in the 200m freestyle, won his third Ulster title of the weekend on Sunday as he sprinted to victory in the 50m freestyle. Rachel Bethel put the disappointment of missing out on her Commonwealth ambitions by winning the women's 200m freestyle to add to her 400m and 800m victories. Paddy Johnston from Ards won two titles - the men's 100m backstroke and 200m butterfly, while team-mates Amelia Kane won the women's 400m individual medley, Emma Reid the 100m butterfly and James Brown took first place in the men's 200m individual medley. Bangor enjoyed success through Jack McMillan in the men's 400m freestyle and Adam Manley in the 50m breaststroke, while 12-year-old Ellie McCartney from Enniskillen won the women's 200m breaststroke. Hill and Sloan join Conor Ferguson, Jamie Graham and Calum Bain as the five swimmers who have achieved the nomination standard along with para-swimmer Barry McClements.